By Kori ~ October 15th, 2012. Rodney Strong founded Rodney Strong Vineyards, located in Healdsburg, California, in 1959. Current owner Tom Klein and the Klein family purchased the winery in 1989. In 2005, Klein added a â€œwinery within a wineryâ€ concept to the Rodney Strong portfolio to focus on small-lot, artisan winemaking. The debut release from their Single Vineyards line was the 2005 Rockaway Cabernet Sauvignon. It was the first in a series of three single vineyard Cabernet Sauvignons. 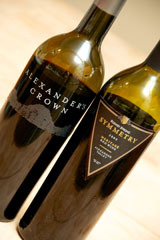 The Brothers Ridge Cabernet Sauvignon debuted with the 2006 vintage, and then the Alexanderâ€™s Crown Cabernet Sauvignon debuted with the 2008 vintage. Symmetry is a red Meritage blend from their Reserve line produced with grapes primarily from those three prized Alexander Valley vineyardsâ€”Alexanderâ€™s Crown, Rockaway, and Brothers Ridge. Recently, we had the opportunity to taste the 2009 vintage of both Alexanderâ€™s Crown and Symmetry in a blind samples tasting. Both wines are very good, but we especially enjoyed the Alexanderâ€™s Crown. In fact, this is the second time we have tasted the 2009 Alexanderâ€™s Crown, and both times we have thought it was excellent. The fruit for both wines comes from the Alexander Valley in Californiaâ€™s Sonoma County. Alexanderâ€™s Crown Vineyard is located in the southern part of the Alexander Valley, just north of Healdsburg. Established in 1971, Alexanderâ€™s Crown is recognized as the first vineyard in Sonoma County to produce a single vineyard Cabernet Sauvignon. It rises to about 350 feet at its peak with a soil composition of predominantly well-drained gravelly loam. If these wines are out of your price range, Rodney Strong also offers a lineup of more moderately priced wines that we have found to be good with high QPRs. 2009 Rodney Strong Alexanderâ€™s Crown Cabernet Sauvignon (Alexanderâ€™s Crown Vineyard, Alexander Valley, Sonoma County, California): 100% Cabernet Sauvignon. Deep, dark purple in color. Nice nose with black fruit and leather aromas. Blackcurrant, black cherry, leather, and cocoa come through on the palate. Full-bodied with crisp acidity and medium to high tannins. Well-balanced with a long, smooth finish. 2009 Rodney Strong Symmetry Meritage Red Wine (Alexander Valley, Sonoma County, California): 79% Cabernet Sauvignon, 14% Malbec, 6% Merlot, and 1% Cabernet Franc. Deep, dark purplish red. Aromatic with black fruit and bacon on both the nose and palate. Medium to full-bodied with lively acidity, medium tannins, and a long, smooth finish.